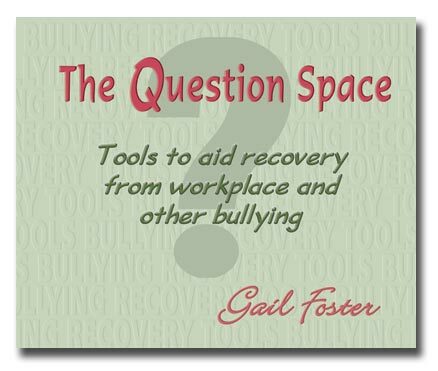 The Question Space is an excellent resource for the difficult but unfortunately common issue of bullying. The blend of personal stories, practical strategies and well-researched information makes this book a valuable addition to your toolkit to aid recovery and resilience. There is something for everyone in this book. Whether you are feeling unsure about the way others are treating you, or if you have suffered years of bullying and have felt helpless to do anything about it. 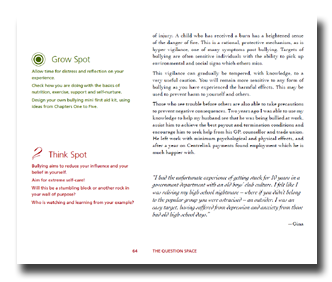 The think and grow spots throughout these pages, coupled with the suggested activities, and contacts help to reinforce and remind us that we all have a built-in ability to cope. Even when we may think that ability has long left us! Unfortunately the printed version of The Question Space is in short supply. Only a few copies are still available. Please email Gail Foster directly to arrange a purchase of the printed book. A second print run will be organised if 20 or more books are ordered. However, The Question Space will still remain available as a Kindle eBook. See the link at the bottom of this page. 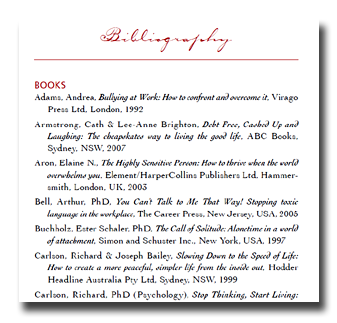 Text from the book has a simple and easy to read layout. 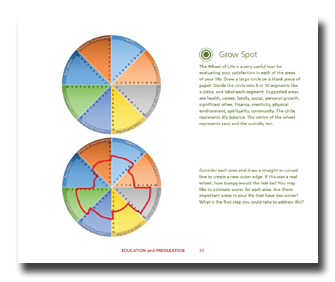 Grow spots are designed to help readers move on with their lives. 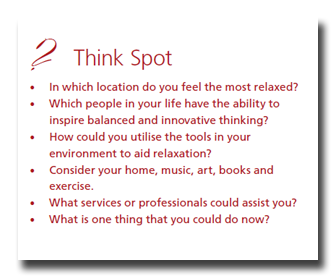 Think spots are simple exercises that are designed to assist you through your bullying experience. The wheel of life is a very useful tool evaluating your satisfaction in each of the areas of your life. A small section of text showing the detail in Gail's book. The bibliography is very comprehensive and covers the whole bullying subject area. The back cover has two glowing reviews of the book. 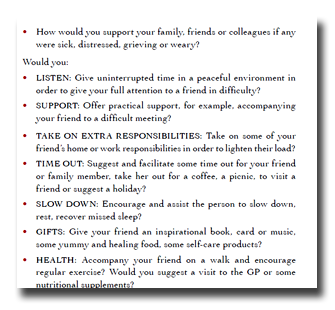 The Question Space is the result of the knowledge that Gail has from her own experiences and training, united with references and quotes from highly respected authors, clinicians, and philosophers. It is a reminder for the reader that they are not alone, and the way they are thinking and feeling is recognised as a very real reaction to awful circumstances. This timely and inspiring book gives hope to those who have been the target of the workplace bully. Tools are designed for possibility thinking and include The Traffic Light Exercise, The Question Space, Using Your Wonder Muscle and a simple ABC Strategy to counter future bullying tactics. The Question Space corrects many common misperceptions and concludes that post bullying trauma is very real, yet healing and joy are possible. It poses the question: Are elements of our social and work environments toxic and unsustainable? "As a colleague of Gail’s nearly a decade ago, I always admired her contagious positive outlook on life. I always believed that she was put on this earth to spread cheer and inspire others. Gail has always had the ability to turn a difficult situation into a practical learning experience and I knew that’s exactly what she would do with The Question Space. However, I got so much more than I expected! My anticipation turned into ever great admiration because Gail has turned her own incredibly negative and traumatic situation into a complete guide to wellbeing for the benefit of others. This is not a pop-psychology self-help book, but it is a well-researched resource that is sprinkled with a deep understanding and awareness from someone who can not only empathise with a victim of bullying, but someone who really does understand what it is like to be on the receiving end of torment." B.A., Grad Dip Psych, M.Ed., M.H.R.M. "There is so much I could commend to you in this book. The comprehensive information, the Think and Grow Spots and the touching quotations. The impact of all bullying is never to be discounted or minimised, my experience both personal and as a counsellor, has taught me this. The information shared in this book brings insight, empathy, experience and a heart of understanding." OAM, M.Ed. 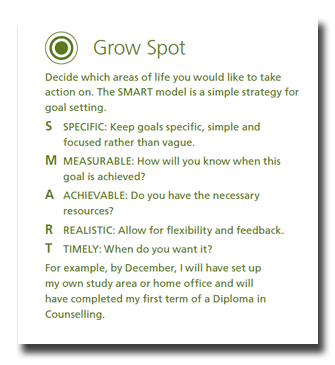 (Counselling and Development). 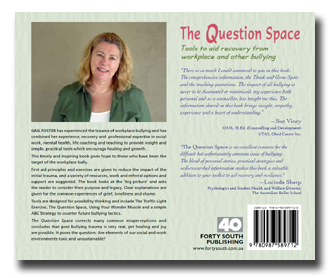 "The Question Space is an excellent resource for the difficult but unfortunately common issue of bullying. The blend of personal stories, practical strategies and well-researched information makes this book a valuable addition to your toolkit to aid recovery and resilience." We have produced a Kindle version of The Question Space for Kindle owners and computer users who have the Kindle reader program installed. It is not available here at our web site, but can be purchased directly from Amazon.com.